Heard about electricity generation by hydropower plants, know what makes them so efficient that they are lightening up our houses. Yeah that’s the whole effort we have put-in to design our turbines, and make them more and more efficient. Now days an efficient turbine can utilize up-to 90% of the water’s potential energy. Although there are various types of impulse turbines available, but Pelton wheel turbine is the most widely used impulse turbine. We can generate maximum up-to 200 MW of electricity from a Pelton wheel turbine, where we have water head (height of stored water), as high as one thousand meter. We know about the potential of water, a very long time from now, when it was used to grind wheat into flour by converting the energy of flowing water into rotational energy through large water wheels. Since then till now let’s see how much we have advanced and changed to use the water’s potential energy in more efficient way. The potential energy of the water is converted into kinetic energy by passing it through a nozzle. Once we have high speed water jet, we can use its impact to rotate a turbine. Or we can say, it works on Newton’s second law of motion, that it depends on two main factors, mass of water flowing in-to turbine, and change in the velocity of the flow coming in-to turbine to that of going out of turbine after impact. As the mass of water entering into the turbine is same as the water going out of turbine after impact, but with a considerable decrement in its velocity. And the intensity of impact depends upon the time taken by velocity to change from maximum (jet velocity) to minimum. Thus impulse turbine only uses the kinetic energy of water to get its power. It is a solid circular-disc with cylindrical shaft in the center. The shaft and the runner both are made from high strength stainless steel where load on the turbine is considerably high. Runners are also made from cast iron where available water head is a bit low, thus force on turbine is not that high. Nozzle directs the flow of water to the buckets, with an increased velocity coming from a high head. Spear is a conical structure which is moved in and out of nozzle to regulate the flow of water striking the buckets. Casing of an impulse turbine is a preventive shielding over the turbine, usually made of cast iron. It also prevents the water from splashing, and also guides it to the spill way. 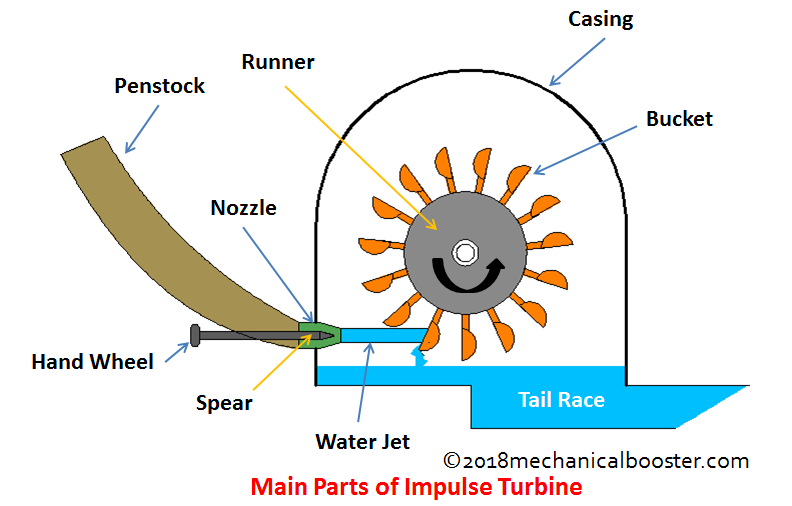 When we say impulse turbine, we are looking at all the turbines using the impulse action of water to generate power. Let’s see how they are different from each other. 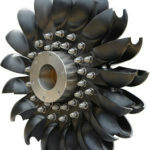 Pelton wheel turbine is the most efficient turbine in the family of impulse turbines. It is at its best when the available water head is high. The buckets of pelton wheel have two hemispherical cups attached to each other, in such a way that their attachment point is a common edge (sharp) called splitter. 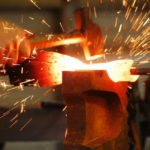 Splitter splits the water jet into two parts, thus making it to flow along the curved path of both the buckets, and transfer the momentum of water to the runner. Pelton wheel turbine also has a breaking jet and a deflector mechanism. Turgo is another efficient turbine, it is almost similar to pelton wheel turbine the only difference is that it has one hemispherical bucket instead of two. So water jets strikes this bucket at its center and thus transfer the momentum of water to the turbine. Turgo turbine is efficient for both medium and high water head. This impulse turbine has cylindrical runner with guide blades at its periphery. These blades are shaped like an arc of a circle and extend along the length of a runner. Water flows transversely through the runner. As water runs through the runner, it passes over the blades twice, thus increasing the turbines efficiency. 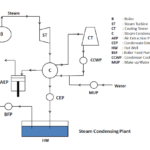 Cross-flow is most efficient where the water head is low, but with good flow velocity. It has got 2 nozzles to distribute the flow of water evenly along the length of the runner. Water stored at a height is passed through a nozzle, situated almost at ground level or ever below ground level. Thus converting the energy of stored water into high speed jet. This high speed water jet strikes the buckets or blades attached to the runner, forcing runner to rotate at its own axis. Thus converting the energy of high speed-jet into rotational energy. This rotational movement of turbine shaft is used to produce electricity through generator. Spear is moved in and out of nozzle to regulate the flow of water, according to the load on turbine. To get maximum power output from a turbine the velocity of jet striking the buckets should be as much as twice the speed of rotating buckets. 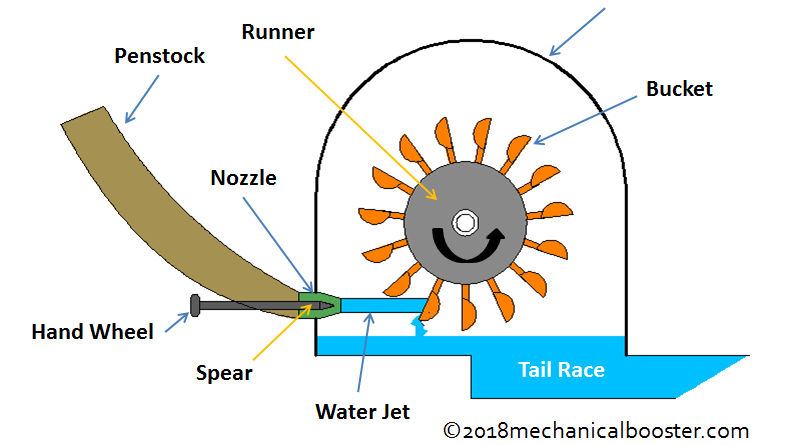 So velocity of water-jet is regulated according to the load or rpm of turbine in such a way that we can keep turbine running in its most efficient range. Moreover, practically we use 3 to 4 nozzles instead of one. 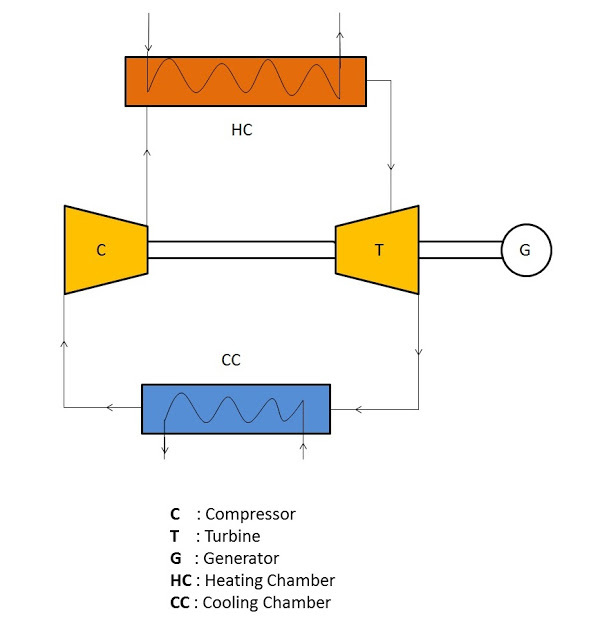 This is done to deal with the high loads on turbine and to increase the power output capability of a turbine. Power is also regulated by closing few nozzles when load on the turbine is low. 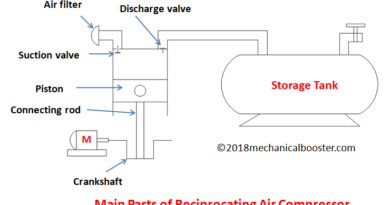 When the load on the turbine decreases suddenly, and spear could not act fast enough to regulate the flow of water-jet, the rpm of turbine will keep on increasing and could damage the turbine. To prevent this from happening we use deflector which deflects the flow of water jet away from the turbine buckets. Thus keeping turbine under safe limits. It is used worldwide to produce electrical energy in a number of hydro-power plants. Turbochargers in automobiles uses the pressure energy of exhaust gases through impulse turbine. Where hot and pressurized gases coming out of exhaust are converted into high velocity jet by passing them through nozzle. It is also used in reverse osmosis plant, where waste water jet velocity is used to run turbine, thus acts as an energy recovery system. 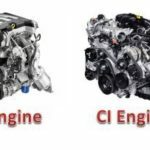 ← What is Stirling Engine – Types, Main Parts, Working and Application?